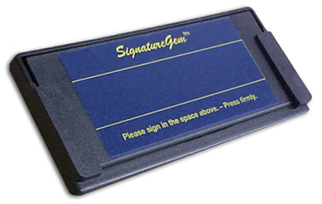 KioskGem 1×5 is a ruggedized electronic signature pad for use in public-access or unsupervised kiosk environments. The signature tablet bolts to a housing with no exposed fasteners and the pen is tethered with a steel cable rated at 160 lbs.All Topaz products come bundled with our powerful software tools and support for the capture, binding, and authentication of electronic signatures. All software and updates are licensed for use with Topaz tablets at no extra charge and can be downloaded from our website.For more information or to purchase, please contact us.